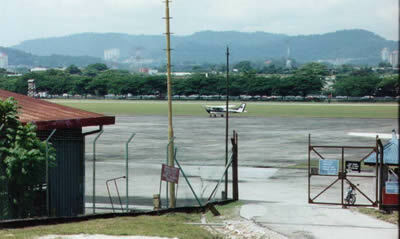 We are on the tarmac of the old airport Simpang at Sungei Besi, along the highway to Melaka. It is hot outside, and inside our Cessna 172 with registration 9M-TOP, we are happy that we can startup the engine so we can enjoy the breeze coming from the propeller. The breaks are released and tested both by myself and my Flight Instructor Yaakub. He is a young Singaporean who adores flying. He learned it in Melaka and he is happy to have found a job here where he can increase his flight hours and being paid for it. We are taxiing over the runway along the cars at the other side of the fence. I can’t hide my smile. I am thinking back to 1996 when I first visited Malaysia and passed along this airport. Airports have always attracted me, but this old airport, with its vintage planes and some military helicopters, has an even more mysterious lure to me. For the first time, I can do all the final checks, push in the throttle, hold the small plane in the center, and pull up at 55 knots. I am flying! Years I have longed for this moment, looked at every plane I heard, stared out off every airport window I passed, gazing at these big birds lined up along the gates. And now, I have found this little club with its old planes, low rates, and colonial character. The training is costly, but still half the price as in Europe. Maybe I will not be able to validate my possible future Private Pilot License in Belgium, but a flying hour is a flying hour … so … I don’t worry. A flying hour in Malaysia, above the jungle and lakes, where VFR flying is only impossible when it downpours, is much more worth it then in Belgium anyway! 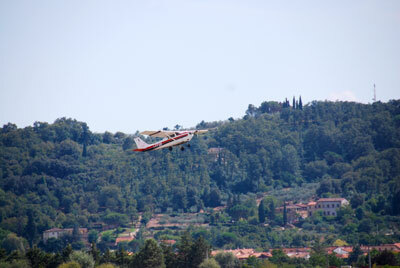 The tower is warning him for us, but we are flying already above the training area, called Romeo 236. It runs from Sungei Long to Kajang. … we answer, when we see the helicopter 500 feet lower, some miles west of us. There is hardly any sports flying done in Malaysia as compared to Belgium. Our club, the Royal Selangor Flying Club, is the biggest with 5 planes and 200+ members. Our club dates back from the time that the Royal Air force was still ruling the air here. It is based in the army camp T.U.D.M., guarded by military. There is a nice museum just behind the entrance gate, which can be visited freely. It features the old planes used by the military in the past. If you have children, or feel like a child, you should visit it. The training is finished for today. I learned to fly Straight & Level: no change in altitude, no change in heading. This is still easy. I am looking forward to when I can do my first landing within a couple of weeks. We run through the downwind checklist. Yesterday, my wife helped me memorize it. She is a bit worried about this ‘real’ flying though. She had to withstand already the many hours of Flight Simulator that I played in preparation to the training at home. This is not required, but it allows me to go faster and save some time and money. I hope that she keeps supporting this passion of mine, now that I don’t fly anymore in my office chair in front of the PC. We are lined up with the runway, floating above Jalan Tun Abdul Razak, with the Twin Towers in our back. And then it happens: Yaakub tells me to take control and do the landing!? Jeezes, now already??? I take the controls and make some corrections, which will surely have been interpreted as “wild” by the cars watching us below. The runway comes closer and when we are about 2 meters above it, I have to “flare”. I pull up. But we gain some height again, and then I push forward. This was wrong: do never push forward when landing, or you risk to land the nose wheel first, and a Cessna is not designed for it. But this time no problem, because we were still high enough. We touch down and roll out. I have too much blood in my adrenaline … but hey, I just made my first landing ! This entry was posted in Experiences, Flying, Training by Steven. Bookmark the permalink.